My parents had inculcated some ideals in me when I was growing up and one of them was not to use swear words come what may. Which meant even if a guy was to come and box my snout, I would have said - "That was a despicable thing to do Old Fruit" or something on those lines. But things changed when I downloaded and tried a very cute distribution called DSL - short for Damn Small Linux (oops! I said it). DSL was created by John Andrews whose main motive was to restrict the size of the resulting distribution but at the same time give a complete GUI environment which included all the softwares that a user might use on a day-to-day basis. He made sure that what ever softwares that are needed were included as long as the size of the resulting distribution could be restricted to just 50 MB. The result is what you see as Damn Small Linux. Tiny Linux distributions are nothing new. In fact, the tiniest Linux distribution (Tomsrtbt) fits inside a floppy and has been around quite some time. But what is unique about DSL is that it is one of the first distribution which contains a GUI environment contained in its small size and targeted at the ordinary user. Also unlike its other counter parts, it is actively maintained by its creator. dsl-2.0RC2.iso - Which can be downloaded by all who have a fairly modern PC and who intend to use it as a Live distribution. dsl-2.0RC2-syslinux.iso - This ISO image can be used by people who intend to run DSL in older machines. dsl-2.0RC2-embedded.zip - This is the most unique in that it can be run from a windows environment. And is ideal if you want to install DSL in a USB key drive for instance. I downloaded the embedded zip file and tried it in both Windows and Linux environment (See screen shots below). DSL uses Linux kernel 2.4.31 and according to the DSL team, they have opted out of using kernel 2.6 because of its bigger size and also their aim to support even very old hardwares which 2.6 doesn't. DSL relies on QEMU to run on top of the host OS (whether it be Windows or Linux). 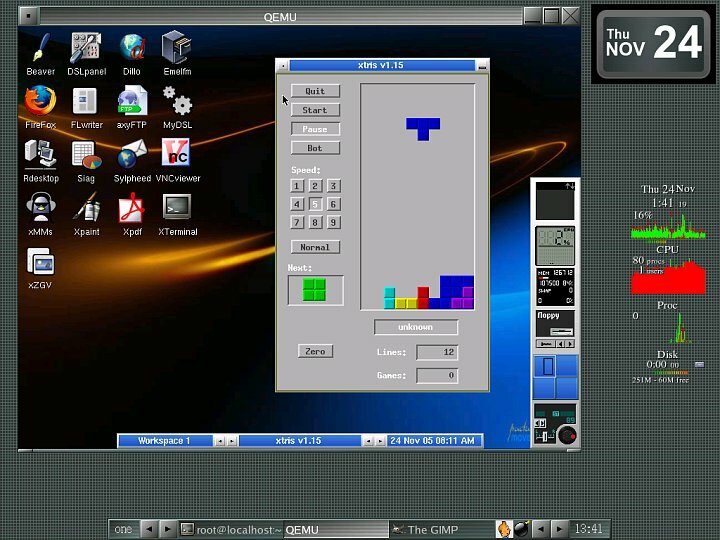 QEMU is an open source cross-platform emulator for Linux hosts. 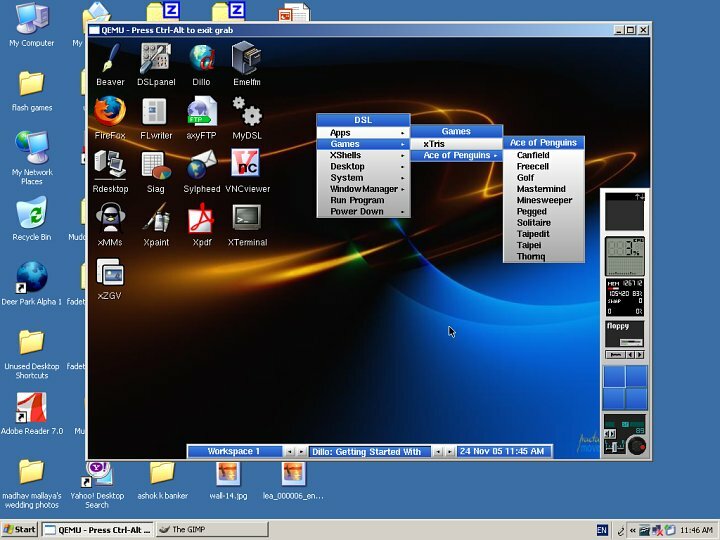 It allows you to emulate a number of hardware architectures (x86, x86-64, and PowerPC are currently known to work, with others, including SPARC and MIPS, in development). QEMU thereby lets you run another operating system on top of your existing OS. Web browser - In fact 3 web browsers - Firefox 1.09, Dillo and Links. Word processor - Believe it or not, DSL comes bundled with a word processor (FLWriter). It even has an MSWord Viewer to view your DOC files. Games - Excellent collection of card games and a game of tetris. CD Burning Software - DSL has included CDW; a curses based CD burning software. DSL gives the user a choice of two window managers. By default it runs Fluxbox which is a light weight window manager. The other window manager being JWM. I have been using fluxbox as my window manager in Linux for quite some time. So I felt right at home the first time I tried DSL. Another aspect of DSL I found fascinating (especially considering its tiny size) was the stress given to usability. All aspects of configuration, which includes wireless network, mouse, keyboard, printer setup and most other services can be achieved via the DSL (Control) Panel. There is something for system administrators too. Suppose you are visiting a Cyber Cafe for checking your mail and you are concerned about your privacy. By using Damn Small Linux on a USB key drive, you can circumvent the problem because all the cookies, browsing history and passwords you use are stored in your USB key and not in the host computer. Your files will not be affected by viruses and worms that are residing in the host computer because you are using Linux on top of the resident OS. For a person more comfortable in working in Linux, DSL is god send because now he can work independent of the environment of the host computer. Where ever you may go, you can take a working OS with you and is saved from being at the mercy of the applications residing in the computers you are using. If you put your mind to it, I am sure you can come up with even more uses for this cute little distro. Damn! damn! damn! I can't stop taking the 'damn' word since I tried DSL (Sorry dad). This distribution truly showcases the power of the GPL which made the DSL project a reality. I shudder to think of what would have been the case if there was no GNU movement. I just wanted to mention that DSL would not be half as fantastic as it is today without the tireless contributions from Robert Shingledecker. Everyone who enjoys DSL owes him thanks. Damm, Damm interesting and damm good review. Damm small linux looks damm interesting. Wonder if it will work on that damm 486 I got gathering dust. Sure. It should work on your 486 machine. But not via a USB key. You will have to install it on to the harddisk. But it will be interesting to know the extent to which a 486 hardware is detected by DSL. Hey, good you see DSL getting more attention. I've used it on and off since an early version, and can attest to the helpfulness of it's contributors and the fanatacism of it's users. I've since moved to a dual Ubuntu/XP setup ('cause I'm lazy) but I found DSL to be a lifesaver on my typically old hardware. Try it loaded into RAM - it flies ('toram' option on boot)! It's probably worth a mention that if you're running something less than a Cray anything run through QEMU will run like a dog. I can't fault QEMU, it really does a great job, but emulation just plain hurts. BTW, I like your site. It gives a nice broad yet useful coverage of linux topics. It's probably my second or third most visited blogroll/feed site. Yes toram is a very good option for people having around 512 MB memory. But I would like to differ with your QEMU opinion. I was able to run DSL inside windows using QEMU and it worked quite smoothly. I wouldn't say it was blazingly fast, but it didn't show any perseptible difference. It is a pentium IV machine but has just 256 MB DDR RAM. Ahh, perhaps so. I've only tested QEMU on my home computer (AMD500MHz/460MB RAM) and work computer (Intel 1GHz/784MB RAM), so probably on a higher horsepower computer I'd be reasonable. On the other hand, DSL used to be blazingly fast using toram on my old Intel 200MMX/256MB machine. You can use the 'toram' option even with 128 MB RAM and you'll be satisfied. Tried it on my 600MHz Celeron and it really rocks! I am new to Linux. What is this 'toram' option? It loads the whole OS to RAM so it only has to go from ram to the chip. not from the drive to the ram to the chip. There is also Puppy Linux, which is only a little bigger than DSL (but smaller than Feather) and comes with AbiWord and Gnumeric. It can be run completely 'toram' or can install a file on your HD to save your settings and install additional software (Scribus is among the applications available). I have an old p75 that's collecting dust. Will DSL run OK (64mb ram, 3 gig drive)? DSL might be a suitable choice for your old 486, depending on the hardware configuration and what you want to do, but it's not the only possibility. I have Libranet 2.7 running on mine, and I've successfully tested stock Debian 3.1. One thing a 486 will benefit from is a custom kernel; it speeded up mine considerably and freed up some RAM. I agree with the person posting about Puppy Linux. If you need a small emergency disk for recovery purposes or to provide emergency access (or that will fit on a business card CD-R, the original target), then DSL is excellent. If you're looking for a lightweight fast distro that actually has enough tools to get more things done, Puppy will save you much grief. dsl-2.0RC2-embedded.zip - This is the most unique in that it can be run from a windows environment. I use qemu to run the dsl-2.0RC2.iso in my .bat here (MS-Windows XP Pro). Is there an advantage to using the embedded version? I am new to linux. What are the commands to boot in "toram". Thanks! In regards to Puppy, I have not found it to work on older 486 hardware. However DSL boots and works fine! Nice review. One thing you didn't mention was the "MyDSL" repository of software available. There is a ton of extra apps that are easily downloadable with a couple of clicks, even when running the live CD. I have a couple of little issues with DSL. I can't seem to figure out how to change the mouse speed, and I can't seem to change the 60hz video so it flickers a bit on my hardware. I've installed it onto a USB key but my PCs can't seem to boot from USB. I have not tried to run it under another OS. Puppy seems to run on only about half the hardware of DSL, the reason why it has more apps is because it lacks many critical moduals. Also, Puppy runs as ROOT and taps into the user's hard drive without asking! This is John Andrews. Thank you for the nice review, I really appresiate the public exposure for our project! second, i downloaded the dsl 2.0 last nite, burned to cd, booted up, THIS ONE DOESNT SEE MY WIRELESS CARD, despite my best efforts....i can swap out the dsl 1.5 cd and reboot, and bam, right on the net again....what kind of goofy change is that???? DSL is cool but I'm a linux newbie. How do I start the desktop? I'm at the # but I don't know how to go any farther. but if there is a key sniffer installed on the host OS, running DSL in embedded mode wont prevent your keystrokes from being logged right? I am not sure about the keylogger. I guess there is a possiblity that your keystrokes might get logged irrespective of using another distribution because you are running inside the parent OS. Throughly clever and ingenious distro. I discovered it by accident. Recently, I downloaded the free VMware Player and several of the prebuilt virtual machines on the VMware site. DSL was one of the offerings. I was astonished-- everything you need is there. I looked at memory sticks tonight so I can carry DSL around in my pocket. Thank you for the explanation of why DSL does not use kernel 2.6. I run DSL 3.0.1 on my old Pentium II 300, and it works like a charm. Oh, it doesn't compare to my 2Ghz Windows box in terms of speed but it is much better than when I had Fedora Core 3 on it. I did the hard-drive install and it works like a charm. I highly reckomend DSL!!! To change the mouse speed use "xset m [speed] [acceleration]"... I need to slow it down lots as my mouse is mega fast, I use 1/2 for my speed and don't bother with setting acceleration. You can do that at the shell or put it in the .xinitrc file if you have a HD install. I have DSL installed on my laptop. I'm trying to configure wireless nic but failed. any advises? The only problem is that I cannot seem to connect to the internet. ifconfig says that it gets an ip and all, but... Dunno, I have to investigate further. DSL is a good as a minimalist distro. But if you are looking for a more usable still somewaht lighter distro you should try PCLinuxOS Junior or PCLinuxOS TinyMe. hahaha! I made my small damn linux run from my USB under windows platform by formatting my USB Flash disk into *bootable and place all files found on ISO files of Damn Small Linux.